Kit White, "101 Things to Learn in Art School"
What is the first thing to learn in art school? "Art can be anything." The second thing? "Learn to draw." 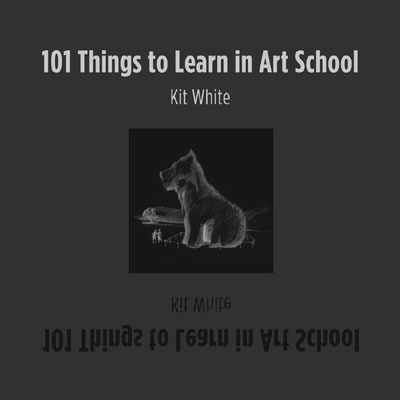 With 101 Things to Learn in Art School, artist and teacher Kit White delivers and develops such lessons, striking an instructive balance between technical advice and sage concepts. These 101 maxims, meditations, and demonstrations offer both a toolkit of ideas for the art student and a set of guiding principles for the artist. Complementing each of the 101 succinct texts is an equally expressive drawing by the artist, often based on a historical or contemporary work of art, offering a visual correlative to the written thought. "Art can be anything" is illustrated by a drawing of Duchamp's famous urinal; a description of chiaroscuro art is illuminated by an image "after Caravaggio"; a lesson on time and media is accompanied by a view of a Jenny Holzer projection; advice about surviving a critique gains resonance from Piero della Francesca's arrow-pierced Saint Sebastian. 101 Things to Learn in Art School offers advice about the issues artists confront across all artistic media, but this is no simple handbook to making art. It is a guide to understanding art as a description of the world we live in, and it is a guide to using art as a medium for thought. And so this book belongs on the reading list of art students, art teachers, and artists, but it also belongs in the library of everyone who cares about art as a way of understanding life.